The gorgeous American actress/dancer Isabela Moner, who was recently seen in the fifth installment of Transformers franchise, Transfers: The Last Knight as Izabella, was in a relationship with Jace Norman. So, is the actress dating a new boyfriend after her breakup with Jace? Let's find out about the current relationship status of the gorgeous actress here in Frostsnow. Who is Isabela Moner Dating Currently? Isabela, the nominee for the Teen Choice Awards 2017, has already taken the industry by storm with her performances and elegance. Isabela is a competition to almost every actress in the industry. She is, in fact, a beauty every man would like to have in their life as a partner. So, what is her current relationship stature? Well, the actress hasn't opened up about her current relationship status, and her dating life. It seems, Isabela, 16, is more focused towards her career rather than being in a relationship. Isabel is very young, and there's a long way ahead for the actress. Also Read: I am excited to be a part of Rufus' claims Jace Norman. Isabel Moner and her ex-boyfriend Jace Norman: A Leftover Relationship! Isabel started dating Jace, an American actor well-known as Henry Hart in the Nickelodeon TV series Henry Danger, in April 2016. The couple broke up after nearly six months of dating in November. In the early phase of their relationship, the couple was in good terms and were also spotted together at various events and parties. 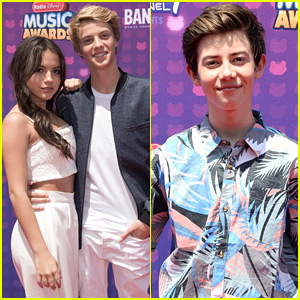 Likewise, the couple was spotted together at their first Red Carpet at RDMA 2016 held at the Microsoft Theatre on Saturday, April 30 in Los Angeles. Right now we’re still friends and stuff, but as you know, we’re both working actors. I’m here right now, he’s in LA, so with traveling a lot it’s been kind of hard. But we’re still friends and we care about each other and lot and we hang out, but it’s been really difficult with my acting and his schedule. Also, check out a video of Isabela's dating history. Hope the actress finds a perfect partner for herself.